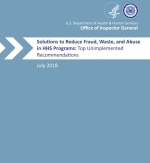 The HHS OIG's 2018 Solutions to Reduce Fraud, Waste, and Abuse in HHS Programs: Top Unimplemented Recommendations was previously known as the Compendium of Unimplemented Recommendations. The Unimplemented Recommendations includes the top 25 unimplemented recommendations and legislative recommendations, drawn from our audits and evaluations, to better protect the integrity of departmental programs and the welfare of those they serve. The Unimplemented Recommendations also includes a broader list of OIG's significant unimplemented recommendations described in previous Semiannual Report(s) to Congress.